1.bright colors help you to be the most conspicuous star in party. 2.Easy to complete your make up of Both Halloween Party ,Masquerade balls,Pagan celebrations or hand fasting. 3.Ideal for any gothic,vampire,witch,sorceress or any halloween themed party or adult fancy dress costume . Size XL (XL=170cm): Approx 66.9 inch(from collar to hem), fit For height 71-78.7inch / 180-200cm . 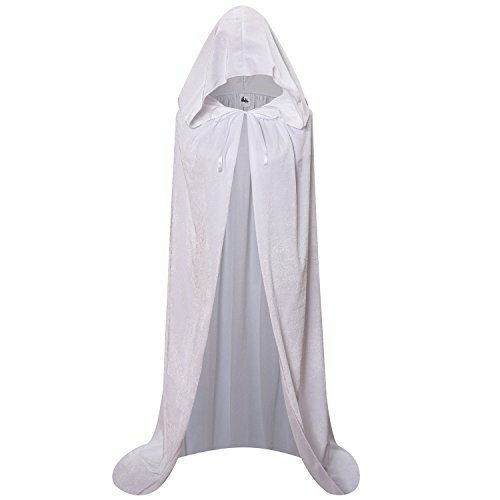 Hooded cape and rope universal use in your life, awesome for Halloween Party, Role Play, Wedding, Stage Costuming Witches, Halloween photos, Vampires, Royalty, magician,Raven cosplay, handmaid costume,Gothic,dress-up etc., go for a mysterious look on Halloween Party . If you have any questions about this product by Makroyl, contact us by completing and submitting the form below. If you are looking for a specif part number, please include it with your message.